Variations exist throughout Germany where some versions are made with a shortcrust pastry versus a yeast dough, some have streusel and some do not, some are round and some are rectangular. 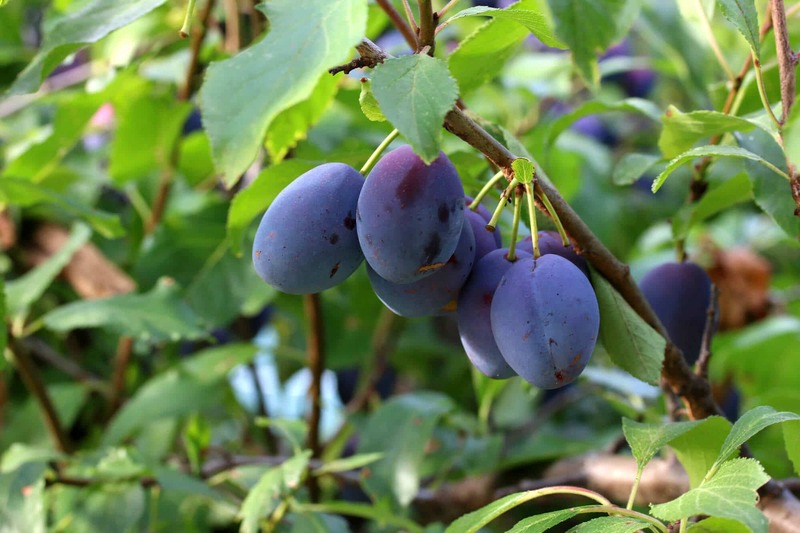 But they all celebrate the plump, juicy, sweet European plum, also known as Italian plums. 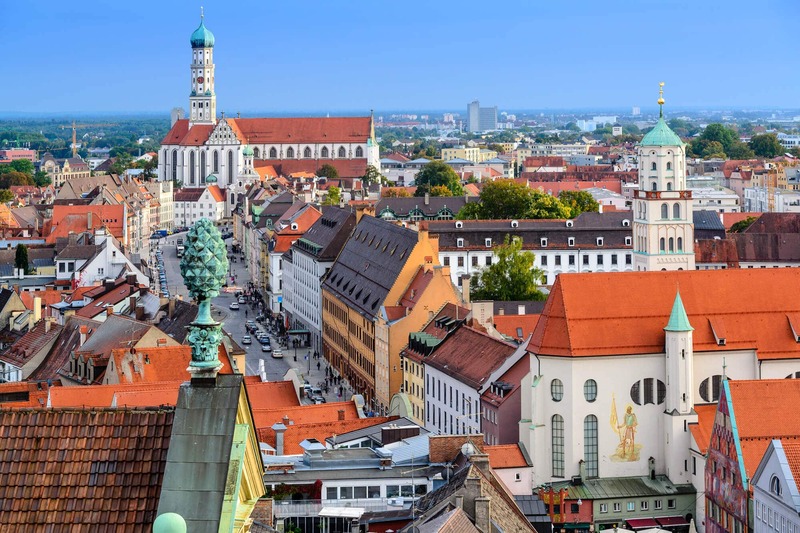 Augsburg, a city in Bavaria northwest of Munich and one of the oldest cities in Germany, claims to have invented the original German plum cake, which they call Zwetschgendatschi. It’s the city’s signature dish. While variations exist even within Augsburg, the original version is made with shortcrust pastry and without any streusel. The version we’re making today is my personal favorite and is typical of the area I’m from of Stuttgart in Baden-Württemberg. It’s made with yeast dough and sprinkled with streusel and it can be found throughout Germany. 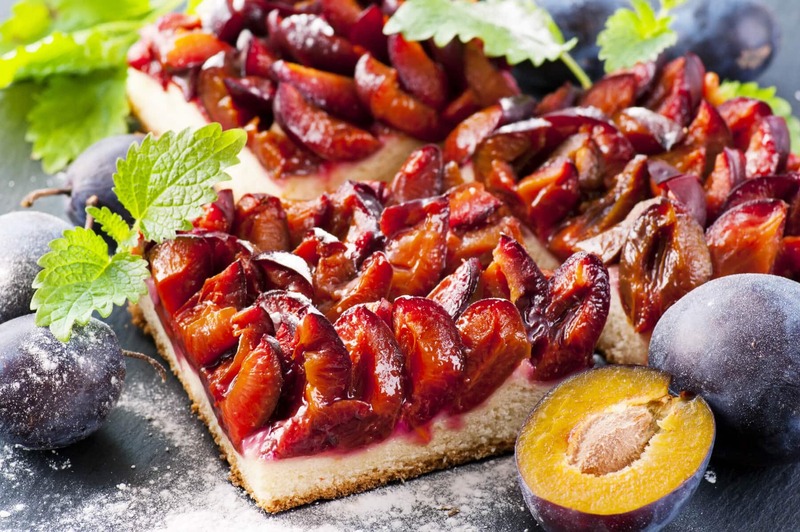 Zwetschgenkuchen typically calls for Italian plums (aka, European plums) and they are the variety most ideal for cooking not only because of their texture but also because their flavor becomes more complex through cooking. Italian plum season is short, usually from September through early October. This type of Zwetschgenkuchen, as with the Augsburger style plum cake, is typically made on a Backblech (a baking sheet) versus in a springform, though many round versions exist as well. 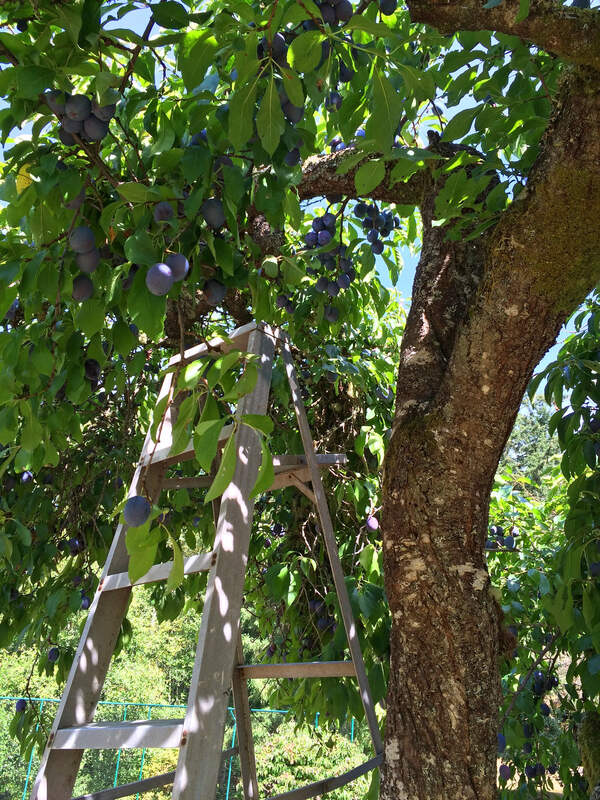 We are fortunate to have several fruit trees on our property, including three Italian plum trees. It’s amazing how much fruit one plum tree can produce, you don’t realize how much until you start picking! Aren’t those plump purple globes simply gorgeous? I set a lofty goal of not letting any of the plums go to waste (very lofty, but I’m determined) and in the last two weeks I’ve been busy at work processing plums in every way I’ve been able to think of. Our family is big into long-term food storage so I’ve also been doing a lot of canning. I’ve been canning plums halves, making plum butter, plum preserves, plum sauce, Chinese plum sauce, making homemade prunes (dehydrating) and freezing them. Whew! Next up I’m making plum leather. 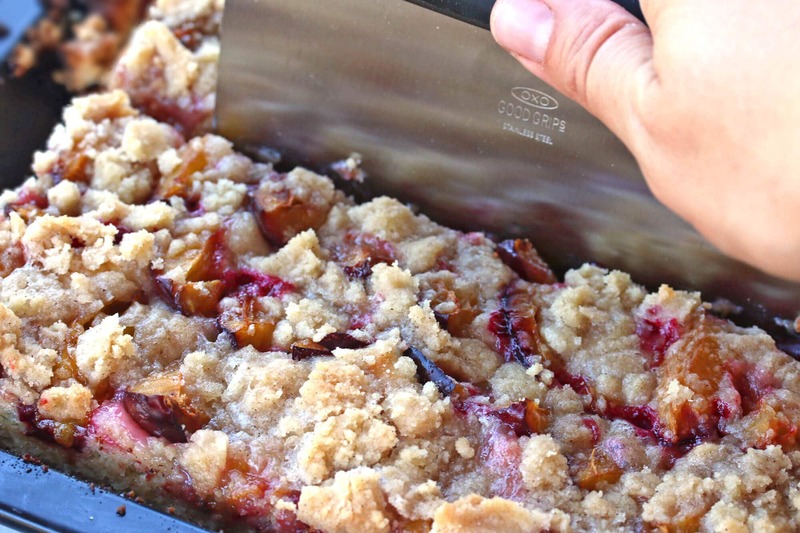 Can you think of any other ways to put bulk quantity plums to use? I’d love to hear them! I’ve turned it into a family effort and our 4 and 6 year old kids have been helping me cut and de-seed the plums. So far we’ve processed over 150 pounds and there’s still a lot more to come! So if you’re ever in the neighborhood and need some plum products, you know where to come! Fruit- and yeast-based cakes are a German hallmark and this Zwetschgenkuchen is a perfect example. It’s not overly sweet, has a touch of tartness to it, a small hint of cinnamon, and that luscious yeast dough. This cake holds up well the next day or two and is even more flavorful as the juices from the plums penetrate the dough. 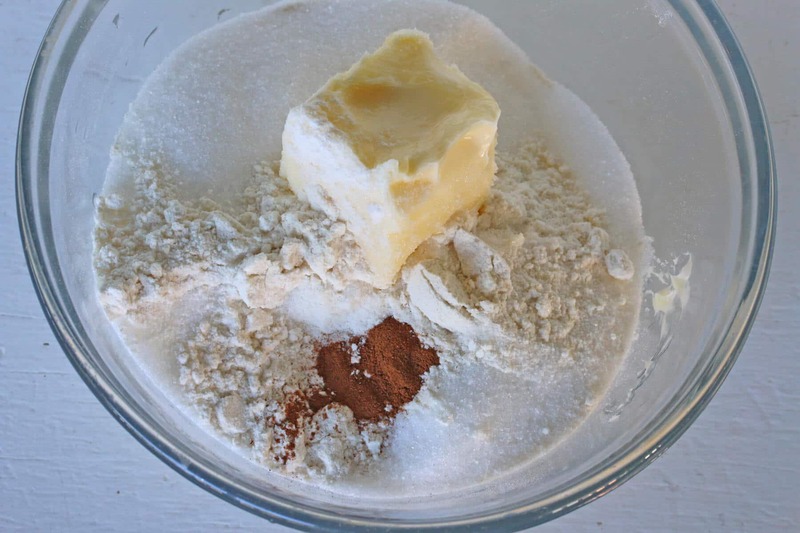 Place the flour, sugar and salt in the bowl of a stand mixer and pour in the yeast mixture, melted warm (not hot) butter, eggs and vanilla extract. Give it an initial stir to combine the ingredients and then attach a dough hook and knead it on the bread setting (“2”) for 4-5 minutes. The dough will be sticky but should hold together fairly well. 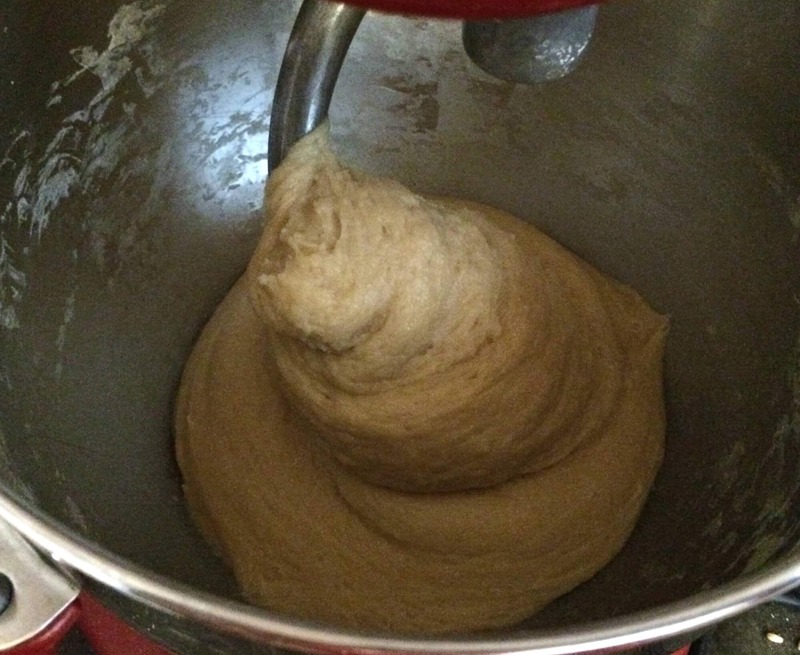 It will not be firm enough to knead into a ball, think of it more as a thick batter. Cover it loosely with plastic wrap and set it in a warm, draft free place to rise for an hour or until about doubled in size. Generously butter a large jelly roll pan (at least 18 inches in length and 1 inch sides but even then the crust will be thicker than with the Backblech – see below) or, like I’m using and as pictured below, a German Backblech. 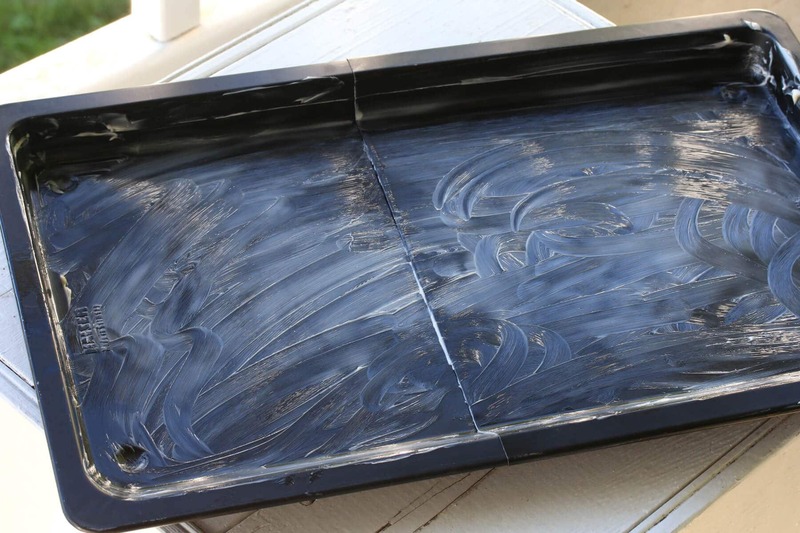 Backblechs are adjustable baking pans that are very common in Germany. They’re fantastic because you can adjust them by sliding them in and out to any length you want clear down to a smaller square. They’re really versatile. The one I have I brought with me from Germany. Virtually every sheet type of German cake calls for using a Backblech. Here’s a similar if not the same Backbech on Amazon and it’s made in Germany. Generously butter your Backblech or sheet pan and place the risen dough on it. 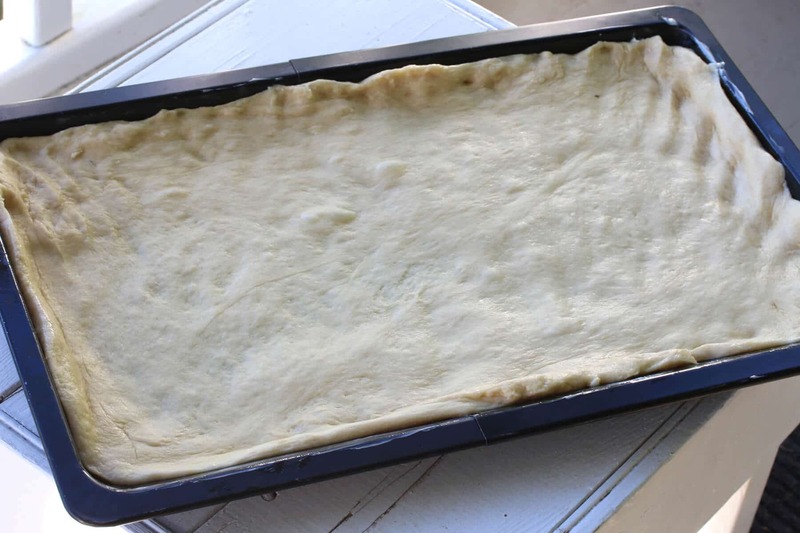 Use your hands to spread the dough out across the full length of the pan, pressing it up against the sides. It’s yeast dough so it will resist, but just keep pushing it back into position the best you can. Once you put the plums on it, those will help keep it in place. The riper the plums the sweeter the cake will be. However, if they’re overly ripe – meaning mushy – they’ll be even mushier on the finished baked product. Cut the plums in half and remove the pits. Then slice the plums in half again, slicing each plum into quarters. 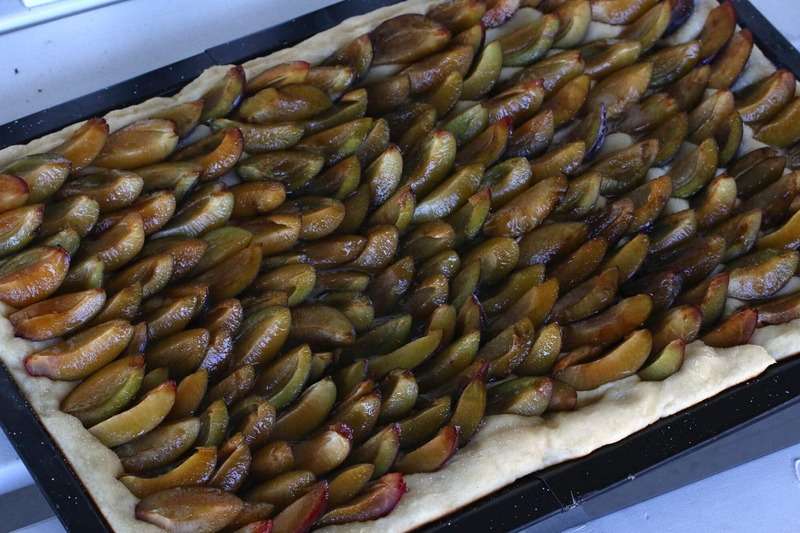 Lay the plums close together in rows over the whole length of the dough on the sheet pan. If you want your cake a bit sweeter you can sprinkle it *lightly* with sugar or cinnamon-sugar if you prefer more cinnamon. I emphasize “lightly” because the more sugar you add the more watery the cake will be as the sugar liquifies during baking and your streusel will also “melt” in contact with it. Set the pan in a warm place and let it rise for up to another hour. Next it’s time to make the streusel. Place all the ingredients in a medium-sized bowl and use your fingers to bring it all together. Work with the mixture until it’s thoroughly combined and forms a rough sand and clumpy texture. Bake the cake on the middle rack of the oven preheated to 350 degrees for 30-35 minutes or until the top is golden. Let the cake sit for at least 10 minutes before slicing to let some of the liquid set. Slice the cake into squares. A tool that I use that’s really handy and works like a charm for sheet cakes and many other things is the OXO Multi-Purpose Scraper & Chopper. It glides right through without scratching up your pan. From the southern region of Swabia, this popular German plum cake features a delicious yeast crust and butter streusel topping! 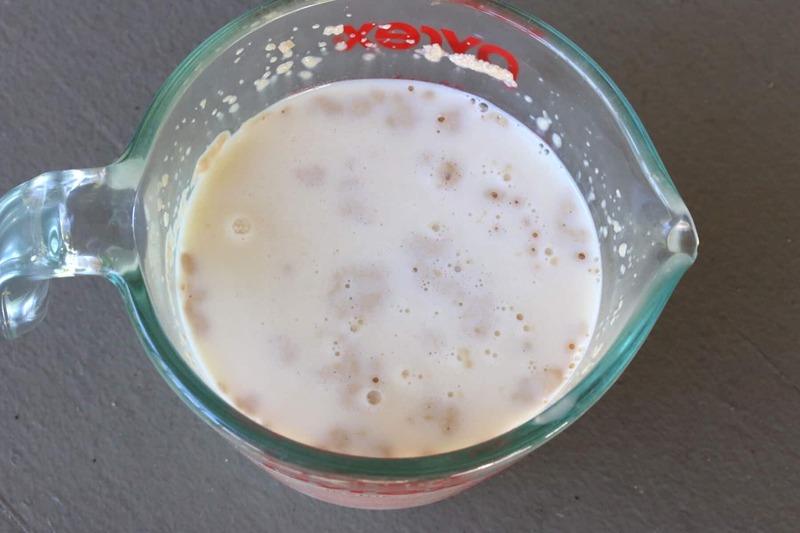 Dissolve the yeast into the 3/4 cup warm milk and let is sit for 5-10 minutes until frothy. 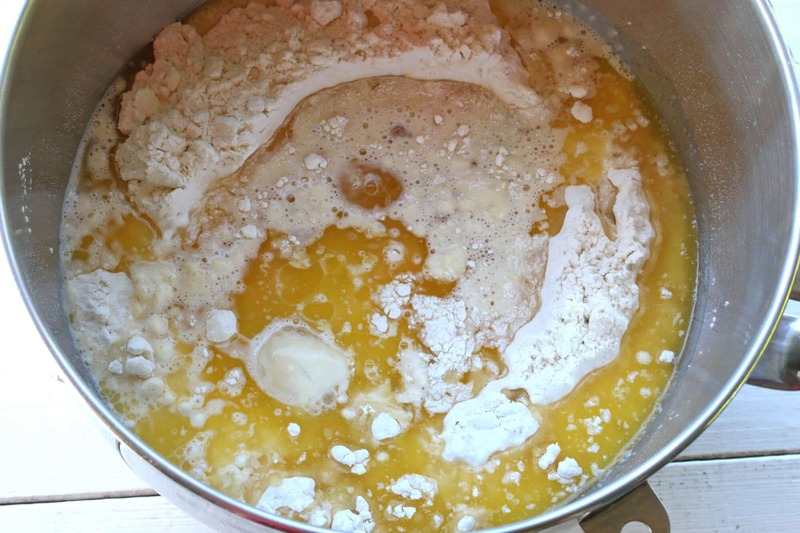 Place the flour, sugar and salt in the bowl of a stand mixer and pour in the yeast mixture, melted warm (not hot) butter, eggs and vanilla extract. Give it an initial stir to combine the ingredients and then attach a dough hook and knead it on the bread setting ("2") for 4-5 minutes, adding the remaining 1/4 cup milk as necessary. (The dough will be sticky but should hold together fairly well. It will not be firm enough to knead into a ball, think of it more as a thick batter.) Cover it loosely with plastic wrap and set it in a warm, draft free place to rise for an hour or until about doubled in size. Generously butter a German Backblech extended to full length or a large jelly roll pan (at least 18 inches in length and 1 inch sides but even then the crust will be thicker than with the Backblech). To make the streusel: Place all the ingredients in a medium-sized bowl and use your fingers to bring it all together. 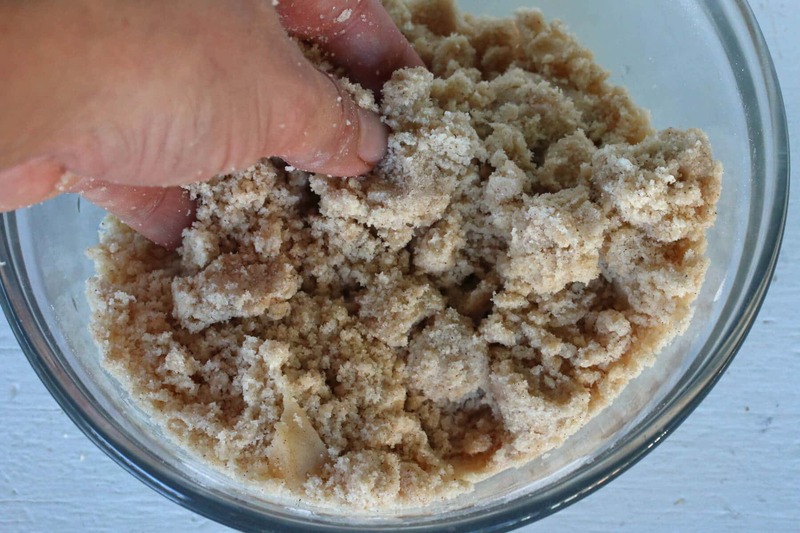 Work with the mixture until it's thoroughly combined and forms a rough sand and clumpy texture. Sprinkle the streusel over the top of the cake. Let the cake sit for at least 10 minutes before slicing to let some of the liquid set. Slice the cake into squares and serve. *This cake holds up well for a day or two and is even more flavorful once the juices have absorbed into the dough. Plum jam for sure, Debra! I forgot to add that I made some plum preserves – less sugar, more fruit – as a filling for another German dessert. I should make some plum jam, too, thanks! What about a canned plum chutney? Where do you find the time, 150 pounds of plums, you must see them in your sleep. I see you dehydrated some. I did cherries after I read your post on all thing cherries, best dried cherries I ever had. I love the expanding pan now that looks like a winner. This looks delicious and as always your history and photoghaphy are beautiful. Wish I was your neighbor, but then you would not have had any plums. Oh my goodness!! I love everything about this cake!! YUM!! Those plums are just stunning! As is the cake :) My parents lived in Germany a loooong time ago (before they had kids), I’ll have to ask if they ever had this cake there! I think Germany has been and always will be one of my favorite countries! This cake is right up my alley! 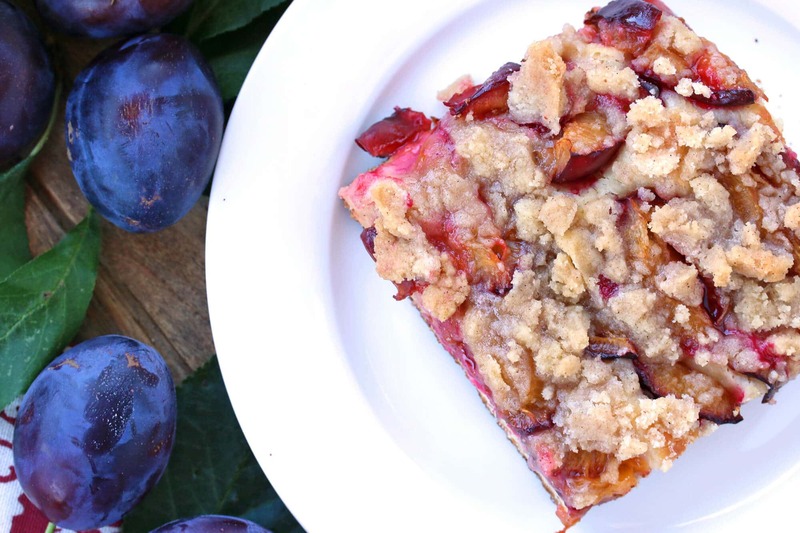 Oh my goodness, this plum cake looks extraordinary! And I seriously had The Best food while I was in Germany, it was so delicious! Oh, wow! I’m in awe of your culinary accomplishments with all your beautiful plums, and of course this lovely, lovely cake! We had a plum tree when I was a kid, but it didn’t yield as much fruit as yours :) How lucky you are to have them! Now that is a lot of plums! I am kind of jealous… and also not. ;) I hate to waste good fresh fruit too, so I know I would also be scrambling to find ways to preserve them. You totally have my mouth watering with these bars! Yum! I love that you used plums, they aren’t used enough! And your pictures are beautiful! Our German friends were just talking about this plum cake they made. Looks delish! I’ve not been to many countries but when hubby and I first got married we traveled to Europe and Munic Germany was our first stop! In fact I loved it more than traveling to Italy and I’m Italian! SO clean, such a beautiful place and these plums are gorgeous, what a cake! 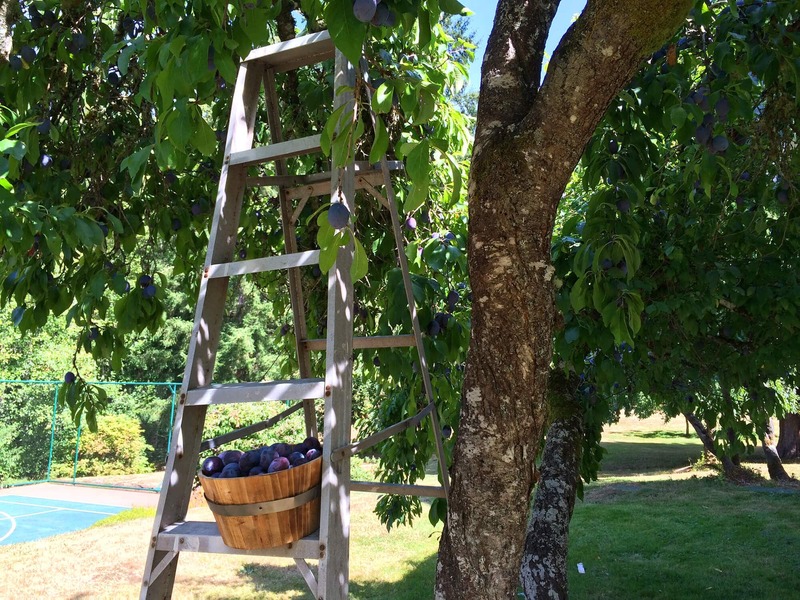 Wow, I am so envious of your beautiful plum tree – amazing! And wow, this cake sounds scrumptious. Those plums are gorgeous! This recipe sounds delicious. I’ve only baked w/ plums once and it was a crisp. I had this at Ocktoberfest last year and feel in love. I can’t wait to try making it at home. Oh goodness. I’m so jealous of your plum trees, and I’m so jealous of your German plum cake! It’s simply stunning!!! Oh my gosh! It looks amazing. Germany is totally on our bucket list to travel to! I grew up with this amazing cake and many others from Germany that my immigrant parents from Hamburg brought to their American kitchen. This was always one of my favorites. Mine, too, Roland. I love German fruit/streusel cakes in general, really nothing beats German baking :) Hopefully your parents brought some of those cherished family recipes with them to hand down. Hi Kimberly. Yes, between my Mother and two German Grandmothers I have learned to use most of their recipes. Thank GOD, Dr. Oetker baking ingredients are readily available because many of the recipes are in his well-worn German cookbooks. 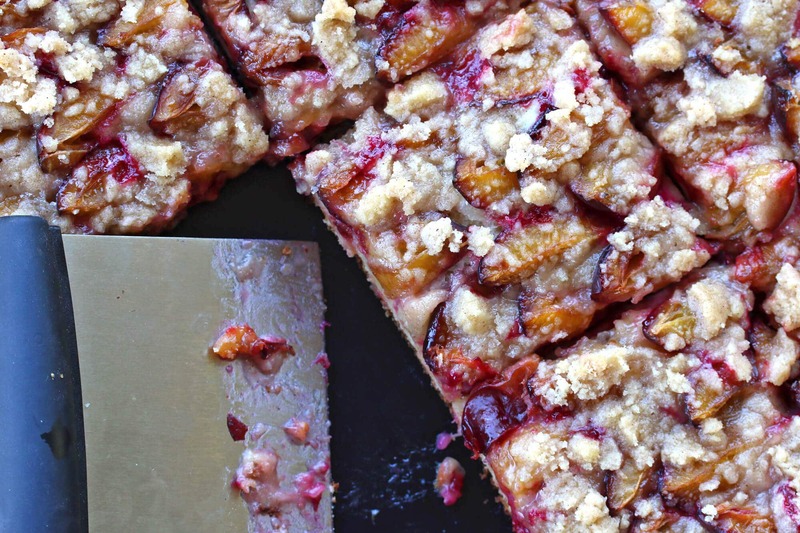 This plum tart looks so good – great dessert! Wow! What an amazing dessert. I always learn something new when I stop by your blog. I love plumbs, but don’t think I can get these little Italian Plumbs here in West Virginia. I’ll keep looking for them, though, this sounds wonderful! Wow! That adjustable pan is something…never saw anything like it. I am going to buy one immediately. My mother used to make this cake, but with muerbe teig(I know that isn’t spelled right). Our plum tree did not survive our very cold winter last year, but I saw some at the supermarket. Now my mouth is watering….we always ate ours with whipped cream. Talk about gilding the lily, lol. My mother made this with peaches, too. You know, I had forgotten all about it until now. Thanks so much for the recipe. Those Backblech’s are fabulous, Gudrun, yet another example of German ingenuity :) Yes, Mürbteig – that’s what I was referring to when I said some versions are made with shortcrust pastry. It’s delicious as well but I’m very partial to the wonderful flavor and texture of yeast dough. Same here, I make this recipe with peaches and apricots also. It’s a very versatile base cake recipe. So sorry to hear about your plum tree, I hope it recovers for next year! In the meantime, I hope you’re able to find some of these plums and enjoy a walk down memory lane with this cake! My daughter’s best friend is from Germany. I should make this next time he comes by for dinner. He’d flip his lid. Great photos and fabulous recipe. This recipe is definitely one I will make. It looks delicious and your photos are great. I love how bright and vibrant these pics are!! And I need a big slice of that plum cake… ASAP! Augsburg looks amazing and those plums are just perfect! I just adore your posts and recipes! Ach! Meiner Vater liebt Pflaummenkuchen! :) My grandfather is from just south of Stuttgart (Grotzingen, bei Aichtal), and this was one of his favorites when my grandmother had access to fresh plums. To this day, my dad waxes poetic about his mom’s version. This looks incredible–I’ll have to share it with him! I just made your cake and it is delicious. I used to live in Stuttgart and this one was one of my favorites among other great German bake goods. Love the yeast dough. Can it be used as a base for apple cake? That’s wonderful, Sonja, I’m so happy to hear it! Absolutely, this is a perfect base recipe for a variety of fruits, including apples. 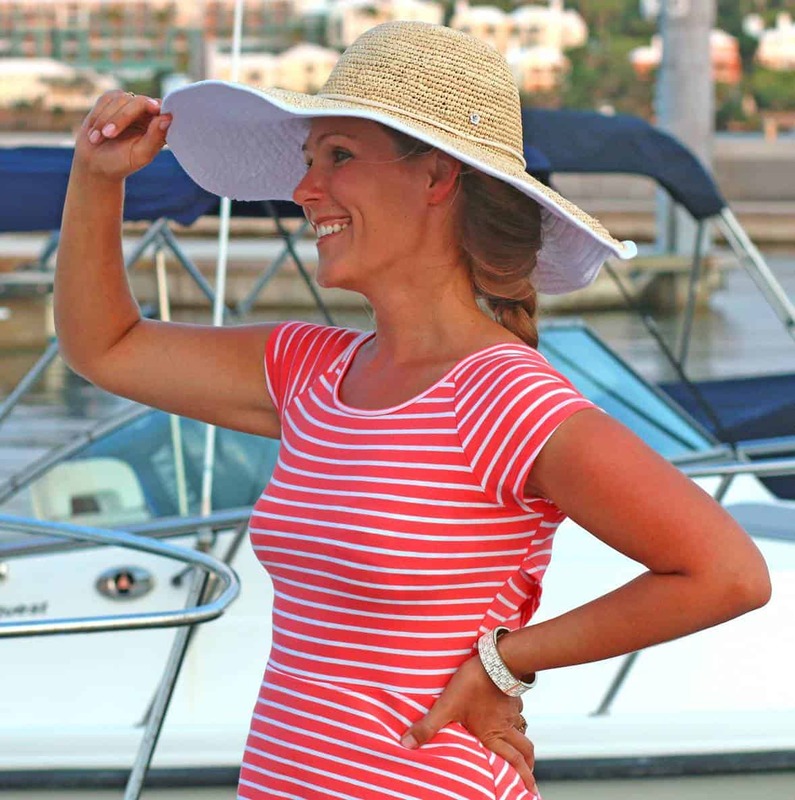 Hi Loreta, I’m so glad you found my site – welcome! I’m sure your friends will be very impressed :) If you bake it completely and then cool it, it should freeze pretty well, except that the streusel will lose its crunch. If your plums can hold out until your friends arrive I would suggest waiting. 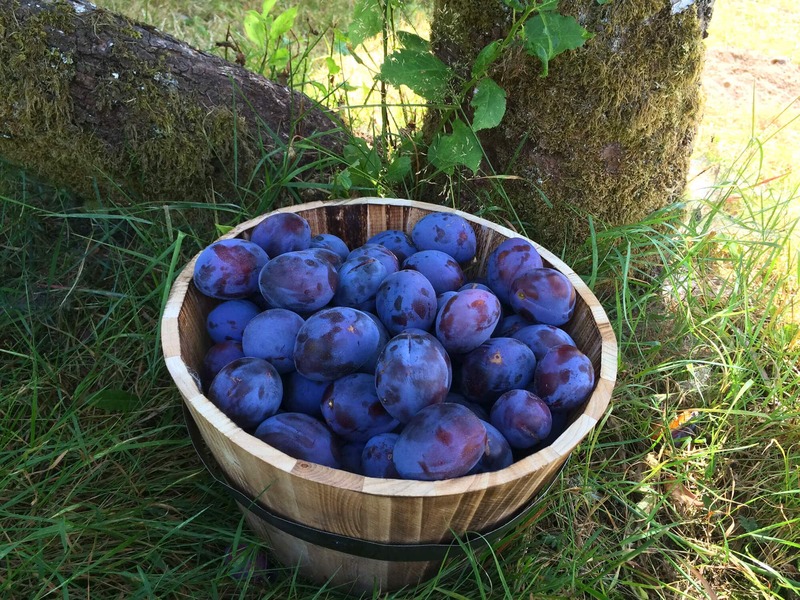 Storing the plums in the crisper drawer in the fridge will prolong their life. Let us know how it goes! So true, Oliver. They’ve found that smell is more closely linked to memory than any of the other five senses and I believe it. This was one of my favorite cakes growing up. However, instead of streusel my Oma used something she call einbrein. Have you heard about that? I would like to find a recipe for that topping. It was more like a sauce that hardened upon baking. Any idea where I could look for that recipe? Hi Sue, do you mean Einbrenn? Einbrenn is a roux, so it’s made by melting butter and adding an equal amount of flour, whisking it until it’s golden, then pouring in milk and continuing to whisk until it’s a creamy mixture. It’s what’s used to thicken sauces and I’ve never heard of it being used as a topping for cake. Another common topping for Zwetschgenkuchen is a layer of vanilla custard that firms up when it’s baked, but it isn’t called Einbrenn, einbrein, or anything similar to that. Yes,it was a type of roux. She would sprinkle the sugar over the plums and then pour the sauce over the cake. Maybe it was designed to absorb the juice from the plums. Oma was German born in Serbia. I don’t think milk was very plentiful. All of her sauces were made with water instead of milk so butter for streusel may not have been available. Thank you for your reply, Kimberly! I just wanted to thank you for posting this recipe. I used to buy a piece of this delicious cake every weekend from a German baker who had a stall at our local farmers market. I have since moved to another town, so I searched on the Internet for quite a while to find a recipe so I could make it myself, and finally stumbled across your recipe. Made it last weekend and it looked, smelt and tasted exactly the same as the one I used to buy, it turned out perfect! And it was really easy to make as well. Will try another one of your recipes next weekend! YES!! I’m so thrilled to hear that, Emma, thank you! As a young girl, going to German School in the 60’s in San Francisco to keep up with the language, I loved eating this plum kuchen at the various celebration and events. Your photos look exactly as I remembered it. I love yeast cakes and breads and this one is no exception. I will make it tomorrow with my Satsuma plums which are a bit juicier than the recipe sites. Thanks for posting this recipe! Wonderful, Lorna, let us know what you think and if this cake is how you remember it! Hi Kimberly, just went to the German Fest in Huntington Beach California, of course had to have the Zwetschgunkuchen, delicious. I bought one slice that was made with the yeast dough then I bought one a whole one at the bakery that was made with a butter crust, both delicious but I’m all about tradition so I’m making yours. I have one question about the backblech, usually when a baking pan is dark it has a tendency to overbake things, do you lower the temp in your oven to accommodate this? I like how it is expandable. Just to let your readers know Costco wholesale sells the plums when they are in season. I’m going to buy some today and try your recipe. I wish I could find those certain plums anywhere. I found some called French plums today at the farmers market. The taste is just like the german plums, but the are much smaller. It’ll have to do. Making zwetschken kuchen tomorrow 😍😍😍, can’t wait! Yay, Petra! Let us know how it goes! It is 10:30 pm on a Saturday night and my whole house smells like heaven! I have two of these cakes in the oven for the last 5 minutes and couldn’t help myself so I took one out and cut the smallest square from the corner. My daughter, husband, and I couldn’t wait to taste it. OH my gosh you have just made everyone in my house so happy!! My kids were born in Germany. We are a military family and have made at least 10 moves in their lives. The oldest is 21! Every place that we have lived is tied to a food and this cake is Germany. My two boys (17 &18 yrs) are celiacs so I had to tweak the flours a bit. It was so worth it! I made one large cookie sheet and a half cookie sheet. Ill be lucky if there is any left for breakfast. Thank you so much for the recipe and the excitement for one of the yummiest memories of Germany!! If is was legal here, Zwetchgenwasser – Plum Brandy. My cousin’s husband in Pfullingen has a friend in B-W, Germany who has a distillers license and makes it from their Italian Plums out of their orchard. I suppose people here might call it Plum Schnapps. For some reason i cannot work with yeast. 100% failures. Would you have a Zwetchgen Kuchen recipe using a different cake recipe. I would love you forever. I can hardly wait for the weekend to make the Kuchen. My mouth is already watering. This is quite a challenge for me, so keep your fingers crossed. My fingers are crossed for you, Greta, and I wish you great success! Try using the batter recipe from Dr. Oetker’s apple cake. My mom used to use this batter for this plum cake when she didn’t have enough time to wait for the yeast dough to rise, etc. I’m not good with yeast either, and my dough rose, but did not double in size and mine still turned out great. Like Kimberly said, give it another try. What a great idea. I will definitely try it today. Many thanks!!! 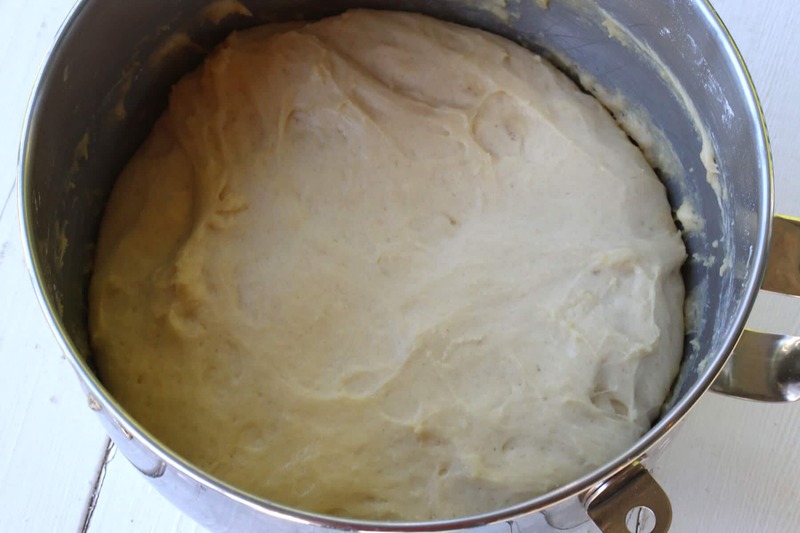 Try this yeast dough recipe. The dough doesn’t need to rise before baking. 1/2 cup (125 ml) milk, 7 ounces (200g) butter, 3 1/2 cup (500g) all-purpose flour, 2 cubes fresh yeast, 2 eggs, 3/4 cup (160g) granulated sugar. Sift the flour into a bowl, make a hollow in the flour, add the butter-milk-mixture. Add the yeast (breake it into crumbs) and the eggs and mix to a smooth dough. Wait a few minutes until the dough starts to float in the water. Take out the dough and mix in the sugar. 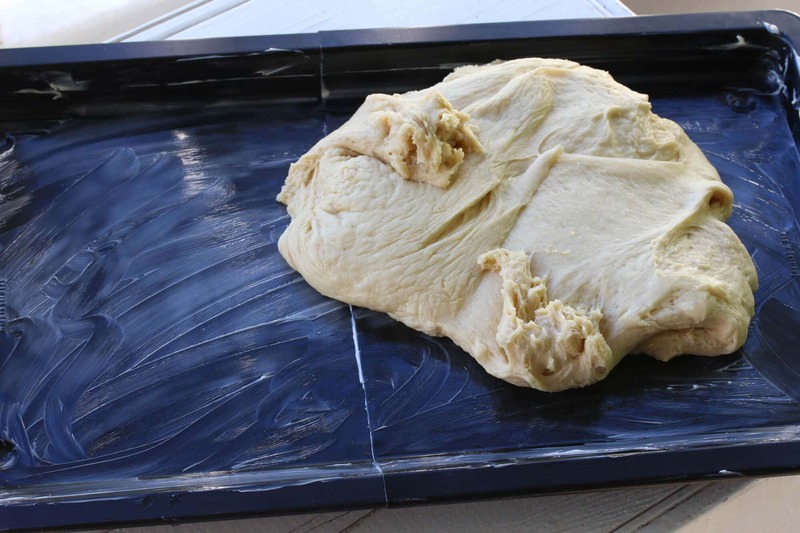 Spread the dough on the baking sheet (buttered). 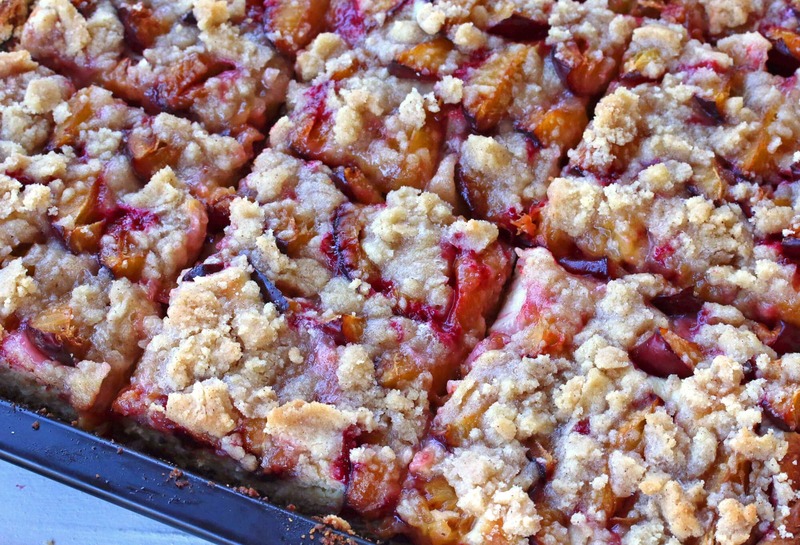 Lay out the plums or other fruit, add the streusel and bake for 30 min. at 350 degrees and than check every few minutes until the dough is golden. I personaly like the dough soaked with the plum juices, so I prepare the plums and sugar them before I start with the dough. This also helps if the plums or not quiet ripe or very sour. Apples in slices work fine or try peeled, cut and sugared rhubarb. Don’t forget the whipped cream on top. I made this today exactly as written. It turned out fabulous! This cake is a must try. Wonderful, Sabine, I’m thrilled to hear that, thank you! Wonderful, Monika! Yes, you can freeze it and then let it thaw at room temperature. However, just know that the streusel will likely lost its crunch, if that’s important to you. Thanks for this! I am going to try making it this weekend. Do you have the quantities in metric measurements? Hi, there’s are several links to this pan in my post to where you can purchase it online (e.g., click on the picture of the pan and it will take you to it). Do you know if the recipe works properly with a large rectangular glass Pyrex dish? ( +- 2″ tall) Maybe too high to bake properly? Anyone try that? Let me know please. Thanks. Hi JP, you can but will need to cut back on all the ingredients – dough, plums and streusel – to get it to fit. 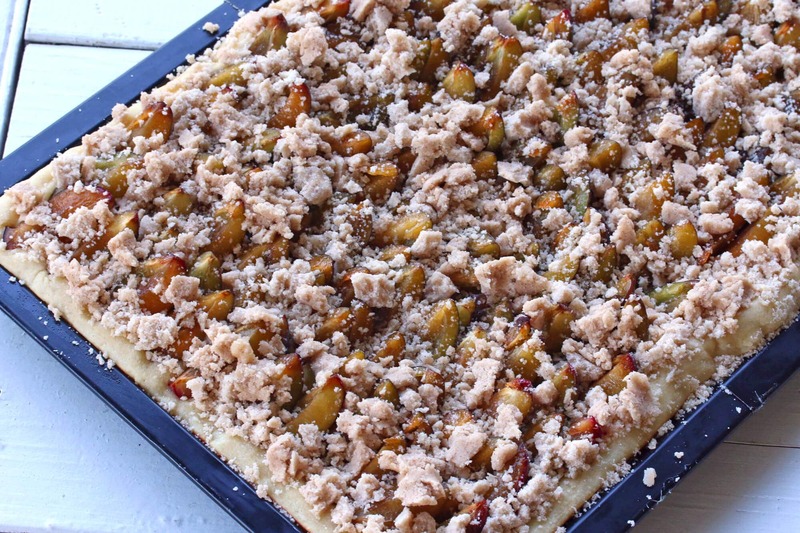 The German baking sheet used in this recipe is much bigger than a Pyrex rectangle dish. This is the exact recipe my Mom used for years. I feel the same about the plums, as you mentioned. I want to save and eat as many as possible. I am now gluten free so i am hoping that this recipe will work with my gluten free flour! Thank you so much for preserving this wonderful tradition of Fall Kuchen! This is the exact recipe my Mom used for years. I feel the same about the plums, as you mentioned. I want to save and eat as many as possible. I am now gluten free so i am hoping that this recipe will work with my gluten free flour! Thank you so much for preserving this wonderful tradition of Fall Kuchen! I have a question:how well does this recipe freeze? Hi Theresa, it should freeze okay fully baked (then let it thaw at room temperature), but the streusel won’t retain it’s crunch, which may not be a big deal. I halved the recipe and used a 13 x 9 glass baking dish. It worked out fine. The kuchen tasted like I remember my Oma’s tasting when I was a child. It was absolutely wonderful! My spouse liked it better the second day when the cinnamon came out a bit more. Thank you so much for the recipe. Fantastic, Cam, I’m so glad you both enjoyed it and thanks for the feedback about the 13×9 dish! I have a question. Are the plums supposed to be very ripe? 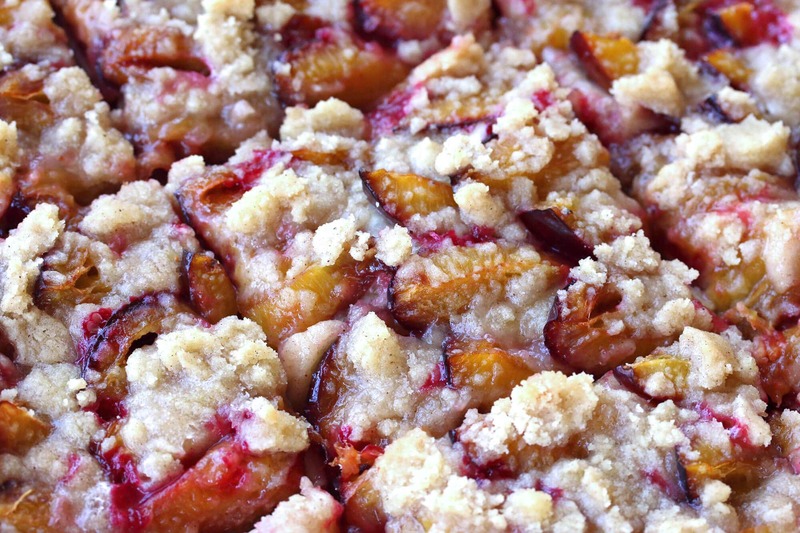 Some recipes call for tart plums but I find they don’t cook down fast enough and then the bread is too dry if you keep the kuchen in the oven too long. We have plum trees and this year the one that did best is the one named Brooks plum. It’s a huge Italian plum so quarters are large. I may cut them into fifths, maybe that will help. I will try your recipe and your method but if you have ever had this trouble of the fruit not being done before the bread and you have any suggestions…I am all ears. This is my favorite cake. Yes, born in Germany, lived in Augsburg. Mother passed, cannot ask her recipe questions. Glad I know what I do. Hi Petra, yes, I use ripe plums because they’re sweeter but they’re still fairly firm and then fully soften during baking. If you haven’t been baking the cake on the middle oven rack, that is what I recommend to prevent the problem you’re describing. I just stumbled onto your site, and it looks great! I look forward to perusing it further as I have time. I make this recipe – very similar to yours – but I want to give yours a try. It looks wonderful! I just want to double-check the quantity of yeast: is 1 1/2 Tablespoons the correct amount? (I’m concerned it may be a little too much). 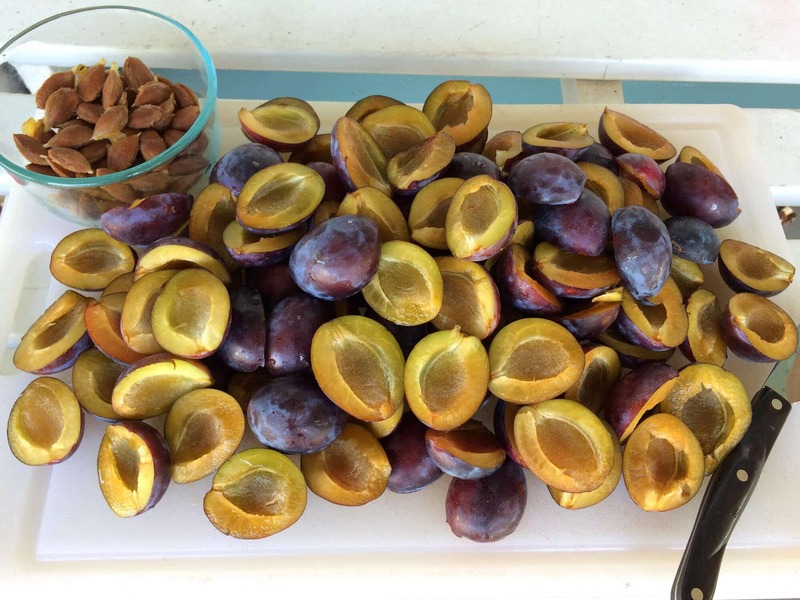 Do you have experience in freezing plums for szilvasgomboc/Zwetschgenknodel? When no plums are available, I use plum butter, but I was thinking it might be great to have frozen plums in the freezer that I can use for making the plum dumplings. I’m thinking they may get too soggy though. But I thought I’d ask you if you’ve tested it before I give it a try. Thank you, Carolyn! Yes, 1 1/2 tablespoons sounds like a lot but it is correct. I haven’t tried using frozen plums before so I’m not really sure. Like you, I have used frozen cherries and other berries and those work fine. So theoretically, as long as the plums are fully thawed and thoroughly drained they should be fine as well. I have been in search of a Plum Cake recipe like the one my Omi used to make for me when I visited for the Summer. 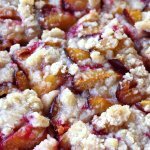 We can certainly go out and purchase Zwetschgen for this recipe, but I wanted to ask if you thought it could work successfully using other kinds of plums. My daughter has been harvesting plums from our neighbors garden, and we have more than we know what to do with, but these are just your traditional dark red skinned plums. I guess we can always just give it a try, but I would hate to waste the plums if you don’t think they will work. Thanks so much!! Hi Leila, some varieties of plums just have more water content than others and so may result in a soggier cake. I’m not sure about the particular plums you have, but you can certainly give them a try. Hi Daniela! The dough will be too stiff for a hand mixer (depending on what kind of hand mixer you have) but you can absolutely knead it by hand. The Kitchenaid is simply a shortcut. Happy baking! Pie filling! Use a spiced plum pie filling recipe, or the one you use for the plums on top of the Zwetschgenkuchen. Or combine the plums with peaches, pears, figs, whatever. Pour it into a ziplock bag and zip it shut. Lay the ziplock bag containing the filling on it’s side in a pie pan. Freeze the entire thing overnight. The next day, take the ziplock bag out of the pie pan. It will be the shape of the pie plate and you can take the plate out and leave the filling in the freezer to use when you like. When it’s pie time, make a fresh crust, and put the frozen disc filling in its as you would fresh. The only difference between using frozen vs fresh is that frozen pie filling needs to be baked a little longer. Bake it at 350 for 1 hour and 15 minutes or until it’s done. Plum pies seem to need to bake longer, so keep an eye on it and maybe bake a little longer if it needs it. I always make these frozen fillings when I have a lot of fruit. It’s a fast solution plus PIE. Brilliant, Ingrid, thanks for sharing! My mom is German and made plum kuchen every year in September. For the last two years she hasn’t been able to find the plums. Would love to send some to her somehow, any ideas? I have a local friend who just gave me some. So we will at least have one. I did see I could send her a tree, but at 76 she’s starting to slow down and might not appreciate that as much as a bushel. Hi Anne, this cake is really best eaten within 2 days, any longer and it becomes soggy so it’s definitely no suitable for mailing. If you mail the plums I would just recommend picking ones that are still very firm. Good luck and I hope your mom is able to enjoy some of this cake somehow, some way! Oh, my mamma used to make this with meube teig some years. Then topped with whipped cream. It freezes well, too. Too delicious for words. Too delicious is right, Emily! Whether with yeast dough or mürbteig, German plum cake is SO good! Too many plums?? Slice the plums in half, remove the pits, dip the cut side unto lemon juice, place cut side down on a baking sheet, put into freezer, freeze till frozen, put into freezer bags, (I usually put in as many halves as you need for a cake), and place back into freezer. 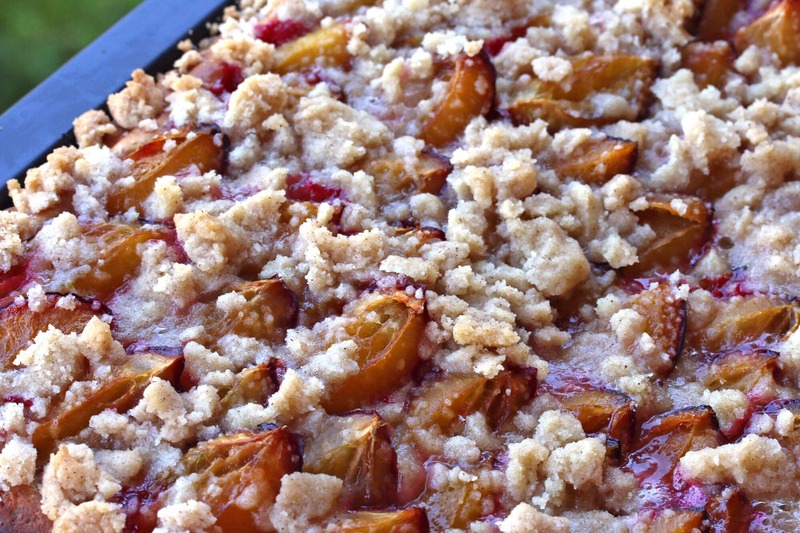 Excellent for use during the long winter months to bake Dutch plum cake or crumble. Works on yeast dough as well, but takes longer for dough to rise, I usually partly thaw them for yeast cakes. Enjoy. Great tip, Luise, thanks for sharing! This was one of my favorite cakes as a child growing up in Stuttgart. My mom made it multiple times during plum season. While I have a lot of my mom’s recipes for her amazing cakes, her plum cake recipe was not part of the collection, so this is wonderful, thank you! Dearest Kimberley. Greetings from New York! Your Zwetschgenkuchen post was very timely and so beautiful. My Mom is also from Stuttgart and we enjoyed the start to Labor Day weekend by baking one too! So delicious and sign that summer is slowly coming to an end. We take every chance to bake when we find Italian plums in our local supermarket. We bake with the seasons so once the plums are finished we will move our sights to Zweibelkuchen. Our mouths watered from your Zweibelkuchen post last Fall! Winter and Christmas are coming too and I can never get enough Hutzelbrot (dried fruit cake). My uncle used to send it from Germany. I long to make it from scratch but it sounds rather complicated. Best of luck with all your Pflaumen. Zwiebelkuchen! Another wonderful childhood memory. I haven’t had it since I left Germany more than 30 years ago. I better look for Kimberly’s post about it! Here you go, Ingrid! :) https://www.daringgourmet.com/zwiebelkuchen-german-onion-pie/ NOTHING says Autumn quite like Zwiebelkuchen! These are my all-time favorite plums. So many memories are associated with them. I’ve never used the yeasted type cake base for plum kuchen. Something to add to the repertoire. Nom Nom. Absolutely delicious!!! When I lived in Germany I used to go down to the bakery in my town this time of year and buy freshly baked plum cake with streusel. I just made this recipe and it brought back those memories. Thank you for sharing this wonderful recipe! Finally found your recipe site ! Getting ready to make your Zwetschgenkuchen . I lived in Stuttgart/Degerloch for many years until we moved to Ulm . Thanks for a great recipe site. Bitte schön, Helga, I’m so happy you found us! :) Happy baking and I hope you enjoy the cake! I’m so excited to try your recipe…I have tried several other recipes over the years, trying to match my Swiss mom’s recipe, but haven’t found it yet. (By the way, my father was born in Germany, as were my brothers…I’m first American born, so German/Swiss cooking and especially baking is what I grew up with.) I have so many of my mom’s cookbooks (several Dr. Oetker) but not quite sure which recipe she used. Can’t wait to try yours! By the way, I have been freezing my Italian plums with great success for year. Quarter and pit them, lay flat on a cookie sheet and freeze, then put into freezer bags for baking throughout the year. (I don’t dip in lemon as suggested by another reader, and mine stay beautiful.) I really notice no difference between baking the fresh plums vs. from frozen, and no need to defrost them at all. Just arrange frozen quarters and pop into the oven with whatever recipe you are using! Thanks for the tip, Linda. I’m going to freeze a bunch this year as well. Please let us know what you think of this cake when you try it! Hi Kimberly, I’ve made your recipe several times now and it is wonderful…very close to what I recall my mother making. Although she didn’t do the crumble topping, but I think it makes it even more delicious. I have wrapped and frozen individual slices because a whole recipe is too much for 2 of us to eat in a few days. But I can grab a frozen slice and take it with me to work and in a short while it is just as wonderful as fresh baked. In fact, I think this kuchen actually gets better after being refrigerated and the crust becomes more moist. I LOVE this recipe and have shared it (link to your web page) on my Swiss-American Facebook group. Thank you so much! I should have added…that it is now November and I just made it again using my frozen quartered plums…you cannot tell the difference from when I used the fresh plums! I still have several gallon bags in the freezer so this will become a regular treat throughout the winter! Hi Michael, it looks like there’s an odd glitch in the conversion software at the moment, I’ve just added the grams manually for those ingredients. Thanks. I’m not totally comfortable with working with yeast so I found a recipe in an old Betty Crocker cookbook for a Kuchen dough which works well for me. Regarding the juices absorbing into the cake and making it mushy, my grandfather a baker, who introduced me to Zwetchgenkuchen over 70 years ago, used to crumble up some cornflakes – not too much but a thin layer – and put them on top of the dough. They absorbed the juice and actually added a extra flavor to the overall kuchen. Maybe not authentic but it worked for us. I just did this cake as I ended up having too many plums to deal with, so I started digging up for recipes. It is amazing! I did not expect too much of a plum cake (I am a lover of chocolate cakes mostly and cheesecakes), but I am sooo surprised. It’s like this fruity-puffy-jelly-caramel like-spices exploding in your mouth. I must admit I also sprinkled on the plums a little ginger powder (about 1 teaspoon) and it’s just lovely. Thank you for sharing. Now it’s on my list to repeat and share with others. Fantastic, Adriana, I’m so happy to hear that, thank you! My mother will be a hundred years old on October 30,2018. She was born in and grew up in Germany. On of her most fervent wishes is a to have a Pflaumenkuchen before she dies.I am disabled and yet i I would dearly like to honor her wish. I have called several bakeries in Washington DC to ask if they could duplicate the recipe 0ne of the problems is no can find European plums that make Pflaumenkuchen so special. 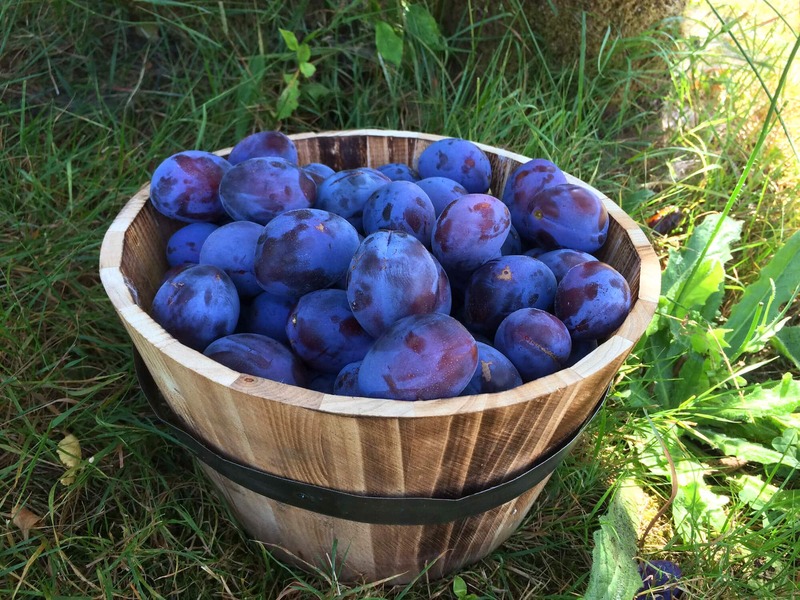 Does anyone know of any bakeries which can make and ship a Pflaumenkuchen or know of a source where I could find these plums out of season? Susan, in a comment above, someone mentioned a place in Washington state that shipped plums. Good luck and Happy Birthday to your mom. i made this cake yesterday and WOW! definitely going into my book of favourite recipes!! I’m so happy you enjoyed it, Hannah, thank you!